Artists in Ceduna and Yalata have a strong affinity with the marine environment in which they live, with whales and marine life featuring heavily in their paintings. The West Coast Marine Debris Workshop project came out of a painting workshop that Natural Resources Alinytjara Wilurara (NRAW) and Ku Arts delivered to Yalata artists in September 2014, as part of a community cultural day at the Whale Watch Centre at the Head of the Bight near Yalata. Inspired by the Ghost Net Art Project that operates in the Gulf of Carpentaria and Arnhem Land; the workshop was a collaboration between Ku Arts, Arts Ceduna and Natural Resources Alinytjara Wilurara (NRAW). 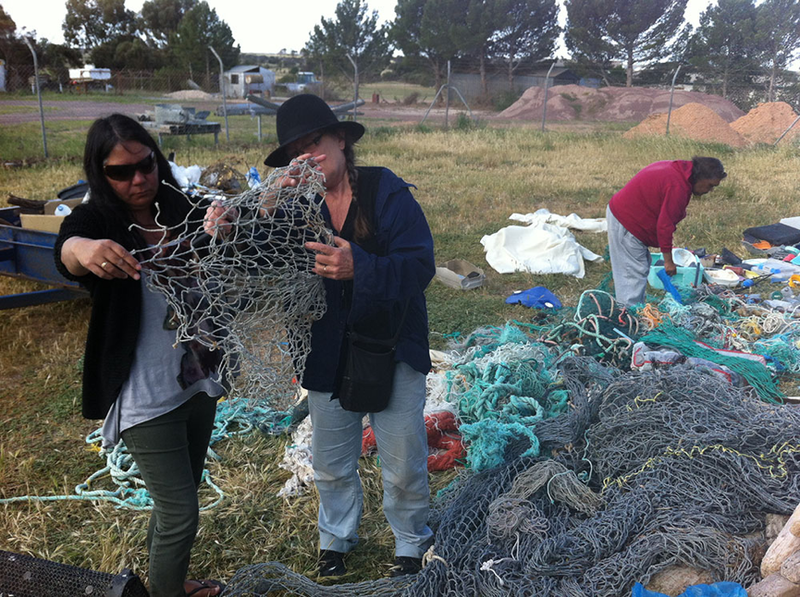 The workshop began with a two-week workshop at Arts Ceduna where artists and rangers were guided by two marine debris art facilitators who have worked extensively with the Ghost Net Art Project in Northern Australia. For the first time, artists from Yalata and Ceduna joined Rangers from NRAW to collect marine debris from the coastline near Yalata. The collaboration resulted in an exhibition of new work which included a large-scale sculpture of a whale, as well as smaller works by individual artists. Artworks were exhibited at the Ceduna Community Hall and the annual Our Mob 2014 Exhibition.